The Brave -Challenging Family Breast Cancer appeal, seeks donations for a programme of genetics research and genetic-based diagnostics. The Brave appeal will support individuals and families who are at high risk of developing breast cancer due to a faulty BRCA gene or a strong family history of the disease. In partnership with Trinity College Dublin, donations received for this appeal will support world class research into identifying ways to reduce the risk of developing breast cancer in these high-risk individuals here at St James’s Hospital. Further funding is needed to pursue this research further. The majority of breast cancers occur by chance. These are known as ‘sporadic’ cancers. However, breast cancer occurs more often than usual in some families due to their genetic make-up. This type of breast cancer is known as ‘familial’ or ‘hereditary ‘breast cancer. It is believed that 5 to 10% of breast cancers are hereditary. Hereditary breast cancers are caused by faulty genes. The most common genes associated with hereditary breast cancer are BRCA1 and BRCA2 which together account for approximately 25% of hereditary breast cancers. The remaining 75% of hereditary breast cancer cases are the result of other faulty genes many of which have not been identified yet. More research is needed to identify new genes, and then further understand the role that these genes play in the development of breast cancer. The complete understanding and identification of the genetic determinants of breast cancer, allows also for better diagnostics and treatment pathways, should breast cancer occur as a consequence of a person’s genetic make-up. About 1 in 20 women are likely to carry a faulty gene that gives them a higher risk than the general population of developing breast cancer. This may vary from a moderate increase in risk to a high risk. Individuals with a faulty BRCA gene and/or a strong family history of breast cancer have a much higher risk of developing breast cancer than the general population. In some cases their lifetime risk of developing the disease can be as high as 80%. About 1 in 20 women are likely to carry a faulty gene that gives them a higher risk than the general population of developing breast cancer. Marie Morrissey, along with her father Desmond Marron and her sister Edel Marron, of Marron’s Pharmacy, Clane, make a fantastic donation of €7000 to the Breast Cancer High Risk Centre. Brave is the only appeal devoted to individuals at high risk of developing breast cancer. Therefore, it you make a gift, we can assure you that your gift will go directly to this field of research and treatment. St James’s Hospital is a Cancer Centre of Excellence and is the largest centre in Ireland for the diagnosis and treatment of individuals with hereditary breast cancer. 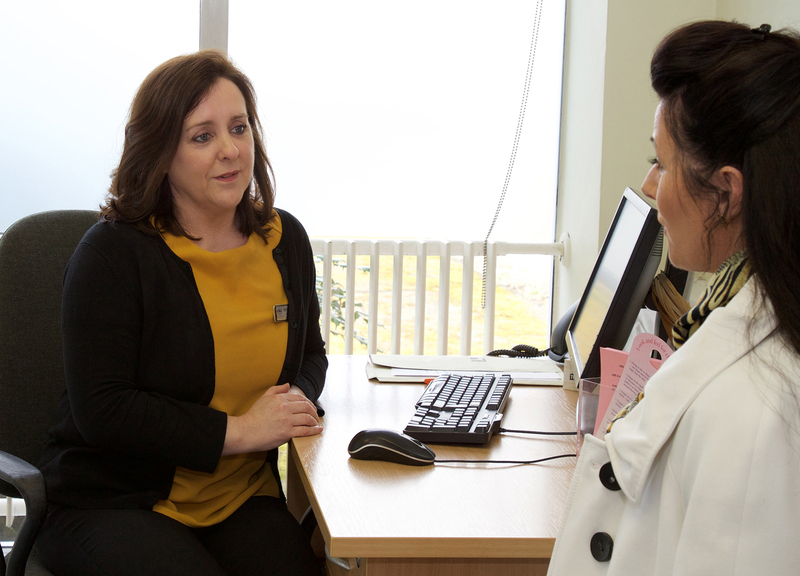 St James’s Hospital runs the largest specialist Cancer Genetics service in Ireland with a dedicated multidisciplinary cancer genetics team with expertise in genetic testing, surveillance and management of high-risk individuals. Individuals with a faulty BRCA gene and/or a strong family history of breast cancer have a much higher risk of developing breast cancer than the general population. In recent years there has been increased ‘penetrance’ of faulty BRCA-genes. This means that nowadays women with a faulty BRCA-gene are more likely to develop breast-cancer than they were in the past. Well designed research studies are needed to reveal specifically what factors have the potential to prevent or delay breast-cancer developing in these high-risk individuals. Research in St. James’s Hospital and Trinity College Dublin aimed at investigating the how targeting lifestyle factors may prevent or delay breast-cancer developing in high-risk individuals has been acknowledged internationally. More funding is required to ensure that this important study is continued. Cancer research is a key platform linking St. James’s Hospital and Trinity College Dublin. The Trinity Centre for Health Sciences is located on the grounds of St. James’s Hospital this proximity allows for effective engagement between research and front-line care by bringing together Research Scientists and Clinical teams. Their shared aim is to develop novel strategies to reduce the risk of hereditary breast cancer in high-risk individuals. Fund world class research carried out at St James’s Hospital and Trinity College Dublin, which will benefit individuals and families in Ireland and potentially internationally. With suitable funding, we can continue our research studies exploring specifically what factors have the potential to prevent or delay breast cancer developing in these high-risk individuals. Research can include staff costs, consumables and equipment. Provide a much needed support programme for individuals and families who are discovered to carry the BRCA gene, but who have not developed cancer. These families need help before and after genetic testing to help them live with the findings and potential actions that they may want to take.